RealTime Gaming, simply known as RTG, is one of the most reputable software developers in the online gambling industry and is highly regarded by players and industry insiders alike. These praises are entirely justified as RealTime Gaming has set up an extensive gaming library that impresses with user-friendly interface, smooth gameplay, colorful, state-of-the-art graphics, and various great functionalities. The creations of the software developer are rather diverse so there are options to suit the preferences of all types of players, regardless of whether they are interested in video poker, card and table games, or online slots. Speaking of video slots, RealTime Gaming’s progressive titles are the ones to attract the greatest number of players to online casinos running on the developer’s software. This is anything but surprising considering the fact the progressive prizes often escalate to life-changing amounts that fall within the seven-figure range. If you are a fan of progressive slots, we believe the following article on RealTime Gaming’s progressives may prove to be of interest to you. Before we proceed with the progressive slots themselves, allow us to say a few words on the history of this well-known casino software developer. RealTime Gaming was established in 1998, in the United States. Thanks to its commitment to quality and innovation, the company managed to quickly build an enviable reputation in the online gaming industry. A reputation it successfully maintains to this day. 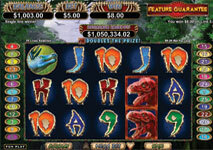 A good portion of this well-deserved success can be attributed to RTG’s extensive collection of premium-quality slots. It all started with the introduction of the Real Series Slots portfolio which helped make RTG one of the most well-known developers in the industry. The titles from the Real Series Slots impressed with crisp graphics, bespoke sound effects, and great features like bonus games and free spins to keep players entertained for hours on end. Due to the legal restrictions on online gaming imposed in the United States back in 2006, RTG was forced to change headquarters and move to Costa Rica. As RTG are not involved with the gambling regulation aspects of the online casino operators they offer their software to, web-based casinos running on the developer’s software are often able to welcome players, residing within the United States. The year of 2007 was marked by the acquisition of RealTime Gaming by the company Hastings International, which is based in the Netherlands Antilles. Progressive slots are among the most sought-after titles in RTG’s gaming library as these give players the opportunity to end their session by winning colossal amounts of money. Players, who register at online casinos running on RealTime Gaming software are typically provided with two options – they can either download the bespoke casino client or opt for enjoying the games in instant-play mode. Slot fans can rest assured they will enjoy a smooth-sailing betting session if they opt for one of the developer’s progressive titles. Each progressive title poses as a combination of superb graphics, engaging animations, great sound effects, and intuitive interface. Betting limits are flexible, so it matters not whether you wish to play on a budget or intend to make more substantial bets per spin. In addition, RealTime Gaming has added various appealing extra features to its progressive slots to further increase their entertainment value and boost players’ chances of landing more regular wins. Some of the best features the slots have to offer include scatters, wilds, multipliers, rounds of free spins, and bonus games with monetary prizes. The developer has so far produced several enticing slots which have progressive jackpots attached to them. Some of the titles, such as Jackpot Piñatas, Spirit of the Inca, and Aztec’s Million, fall into the category of Wide Network Progressives, meaning that they are linked to a jackpot network that encompasses all online casinos that operate on RealTime Gaming software. Needless to say, this allows for massive amounts to accumulate, which renders the aforementioned titles especially appealing to players. Also, the pools on wide-area progressives tend to build at a much faster pace since there is a greater number of players, who contribute to the pot. There is a common misconception that casino operators collect massive cuts from progressive jackpots. The truth of the matter is operators indeed generate greater profits from the progressives they offer, but this can be explained with the lower player return percentages of such games. You may notice the RealTime Gaming slots that are linked to a wider area network pay regular wins less frequently to offset the consequences of someone potentially winning the pot. However, these slots are well worth your time as the prize typically escalates to reach life-changing amounts. There is no need for players to make any side bets to qualify for the slots’ progressive prizes since their contribution is actually built into the games’ payout percentages. This contribution, or fee, is subtracted automatically when the bet is made. A given percentage of each player’s contribution goes towards the progressive pot. Then again, a smaller part of all contributions is used to fund the pot if somebody wins and the prize is reset. When someone wins, the jackpot is reset to its base amount, so it does not accumulate from scratch. The base amount is referred to as the “seed” and serves as an incentive for players to continue betting on the progressive slot even if someone wins the huge prize. Some of the progressive slots by RealTime Gaming have “boiling” points, which means the prizes are won whenever the pots escalate to a specific, predetermined amount. Then again, there are some RealTime Gaming slots which fall into the category of the Local Area Progressives. These are usually linked to a single online casino operator, which is to say fewer players contribute to the accumulation of the prize pools. The jackpots on such slots are less impressive in size, but players’ chances of triggering the progressive prize are greater. If you are interested in giving RealTime Gaming’s progressive slots a try, we suggest you take a peek at our short overviews of five of the most popular progressive titles on the developer’s portfolio. These are massive hits among players as the prizes usually escalate to reach six or even seven-figure amounts. Aztec’s Millions is among the most sought-after titles in online casinos operating on the developer’s cutting-edge software. This is a 5-reel slot which enables players to bet on as many as 25 adjustable paylines. As the title suggests, the theme of the game was inspired by the ancient South American civilization. Betting limits are rather flexible so that the game can suit big and small bankrolls alike. Players will benefit from a number of extra features including the scatter idol symbol, which can potentially unlock rounds of free spins, with multipliers attached to them. Thus, players can potentially triple all prizes they have generated during free spins, with the exception of the progressive jackpot, of course. Another lucrative symbol in this game is the stacked wild, represented by the king of Aztecs. It can substitute for all other symbols in the game, with the exception of the scatter and the jackpot symbol. 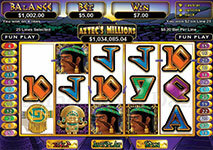 In order to collect the handsome progressive prize, players need to land five symbols with the Aztec’s Millions logo on an active payline. Once reset, the jackpot seeds at the record amount of $1 million. Jackpot Piñatas is yet another fun slot, courtesy of RealTime Gaming, that provides players with the opportunity to collect a life-changing progressive prize. This is a Mexican-themed slot which incorporates 5 reels and has a total of 20 paylines. The game pleases the eye with colorful and crisp visuals while the great sounds further add to its appeal. Some of the symbols players will come across the reels include sombreros, limes, tacos, maracas, and boxes of presents. Extra features like the scattered Piñata Dog and the wild Piñata Donkey aim at increasing the players’ chances of collecting a payout. 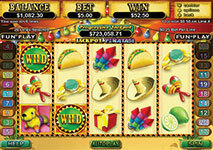 In addition, Jackpot Piñatas treats players to rounds of free spins and a fantastic bonus game. The latter is triggered by three or more Piñata Dogs anywhere on the reels. Players are then supposed to choose two out of three Piñatas to reveal the hidden prizes that reach up to 200 times their original bet. The progressive jackpot, on the other hand, is triggered by the Piñata Bull symbol. Land five of those on an active payline and the progressive prize is yours to keep. The pot on this slot starts seeding at the base amount of $250,000. This is yet another RealTime Gaming progressive slot that was seemingly inspired by an ancient South American civilization. With his particular game, however, the software developer aims at introducing players to the ancient civilization of the Incas. 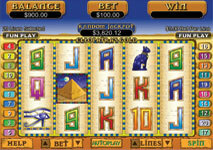 The game features 5 reels and utilizes a total of 25 paylines. The high-paying symbols all slot fans are hoping to line up on the reels include the ancient temple, a statue of a wild cat, a gold bracelet, and a scroll. 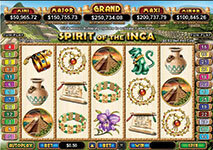 Spirit of the Inca has two great features to offer. The first one is the Incan spirit wild which substitutes for all other symbols on the reels, including the scatter. The scatter in question is represented by an Incan priestess and can multiply all wins by the amount of the player’s total bet. All symbols pay from left to right save for the scattered priestess which lends payouts in both directions. A pick-me-styled bonus game is also included. What makes this slot so appealing is the fact it features not one but a total of five progressive jackpots, namely the Mini, Minor, Major, Maxi, and Grand prizes. These are awarded at random and have what is called a “boiling” point. Once the jackpots escalate to a predetermined amount, they hit. The boiling points for the Mini, Minor, Major, Maxi, and Grand pots are set to $100,000, $150,000, $200,000, $250,000, and $300,000, respectively. A percentage of all players’ bets goes towards the three largest prizes. The Queen of Egypt served as RealTime Gaming’s inspiration for this vibrant and engaging slot, which also has a huge progressive prize to offer. Cleopatra’s Gold is played across 5 reels and players can bet on up to 25 paylines. The developers at RealTime Gaming have spared no efforts in creating this enticing game – to say Cleopatra’s Gold is a feast for the eyes would hardly be an overstatement. The symbols used in the game are exceptionally crisp, not to mention the user-friendly interface renders the game fit for any slot fan, regardless of their level of experience. The slot certainly does not lack in terms of special features. The pyramid is the scatter here and it pays in any direction. This is not the case with other symbols which pay from left to right only. In addition, all winnings generated with the help of the scatter are multiplied by the amount of the overall bet. Three or more scattered pyramids anywhere on the reels reward players with 15 free spins. What is more, players can also re-trigger the rounds of free spins. Of course, it is the progressive prize that all slot fans covet. To collect this impressive amount, players who opt for Cleopatra’s Gold need to land five Cleopatra wild symbols on a payline. When reset, the slot’s pot starts seeding at the base amount of $100,000. RealTime Gaming takes players on a journey back to prehistoric times when dinosaurs used to roam the Earth. To keep in line with this theme, the software developers have opted for incorporating various dinosaurs as symbols on the reels. Speaking of reels, there are five of these here, with the option to bet on up to 25 paylines. Players can also choose from three different betting options, namely the Minor, Major and Mega bets. The game has plenty of great features to offer, including the green and red Megasaur wild symbols and the volcano scatter, which activates the rounds of free spins. It goes without saying, it is the progressive prize that holds the greatest appeal for players. The size of the Megasaur jackpot corresponds to its name as the sum players can potentially bag in this game is truly gargantuan. The pot is awarded to the player who succeeds at landing five volcano scatters anywhere on the reels during a round of free spins. The progressive prize tends to escalate rather quickly as the pot starts seeding at $1 million, when reset.